The River Nidd rises in Nidderdale at Nidd Head Spring on the slopes of Great Whernside in the Yorkshire Dales and flows for approximately 58¾ miles before it joins the River Ouse at Nun Munkton. In its first few miles the river is dammed three times to create Angram Reservoir, Scar House Reservoir and Gouthwaite Reservoir. In dry weather the river disappears underground into the sink hole known as Manchester Hole then flows through the caves and reappears at the rising Nidd Head to the south of Lofthouse. In wet weather the Nidd can cause the reservoirs to overflow and the underground caves in the valley become flooded which allows the river to flow along the normally dry river bed past Lofthouse through to Gouthwaite Reservoir. The river then continues through Pateley Bridge then meanders past Glasshouses, Summerbridge, Dacre Banks, Darley, Birstwith, Hampswaite, Scotton Banks, Knaresborough, Little Ribston, Cowthorpe, Cattal, Moor Monkton before reaching its destination. Pateley Bridge is an attractive market town in Nidderdale in the Borough of Harrogate, North Yorkshire. This market town with its spring and summer floral displays has won the Britain in Bloom competition twice and the River Nidd flowing through it enhances its beauty. There are many signs of 18th and early 19th century buildings and shops along the steep narrow main High Street including the oldest sweet shop in England and the best butchers shop in Yorkshire. Pateley Bridge originally relied on lead mining, stone quarrying and flax which can be seen in the Nidderdale Museum. Also well worth seeing in the craft workshops is the glassblower, a potter and a jeweller and there is the Pateley Playhouse ‘Little Theatre of the Dales’. Nidderdale Festival and one of the best Agricultural Shows are held annually on the showground and car boot sales are held on Sundays. The Nidderdale Way is a 53 mile circular walk starting and finishing in Pateley Bridge. The route, with its own unique symbol seen on finger posts and waymarks, takes you through beautiful and contrasting countryside from the spectacular uplands around Scar House Reservoir to the more gentle rolling pasture and river valleys along the course of the Nidd. Pateley Bridge takes its name from ‘Pate’ an old Yorkshire dialect word for ‘Badger’. In August 1849 a Nidderdale Omnibus started operating between Pateley Bridge and Ripley Station and until 1964 Pateley Bridge was the terminus of the Nidd Valley Railway, opened by the North Eastern Railway in 1862, which ran from Nidd Valley Junction near Harrogate. Gouthwaite Reservoir, constructed between 1893 and 1901, is a nature reserve and Site of Special Scientific Interest only 2.5 miles west of Pateley Bridge. The Elizabethan manor house of Gouthwaite Hall, the ancient home of the Yorke family, was submerged beneath the reservoir. Gouthwaite White Hall was rebuilt beside the reservoir with materials from the old hall and is now a Grade II listed building. The reservoir is owned by Yorkshire Water which has created three viewing areas on the edge of the reservoir. The road side and the small car park on the left about half way along have good views of the reservoir and many types of birds and wildfowl can also be seen. Angram Reservoir at the head of the dale and closest to the source of the River Nidd was completed in 1919. It is the first of one of three reservoirs on the River Nidd the others being Scar House and Gouthwaite reservoirs. The views of the summits of Little and Great Whernside, on the ridge to the north of Angram, are superb. 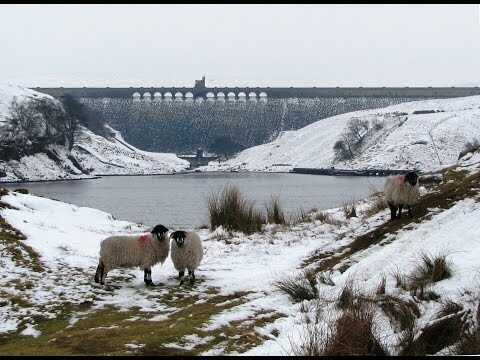 Scar House Reservoir was the last reservoir to be built in 1936 and took 15 years to complete. The dam is 71 metres high and rises to 55 metres above the river and is almost 600 metres long. Stone for the dam was quarried from the two quarries on either side of the valley, one being on Dead Mans Hill where steam houses can still be seen. During the construction period a village was built just below the dam to house the work force. The village had hot and cold water, electric lighting, flushing toilets, shops, a cinema, a concert hall and a hospital with a resident doctor and nurse to care for the workers as conditions were very harsh. The concrete bases on the approach to Scar House, is the only evidence of the remains of the village. Scar House and Angram were built to supply water to the Bradford area of West Yorkshire and the water is transferred via the Nidd Aqueduct, which is a major engineering achievement as it transports water without pumping. Between 1907 and 1937 the Nidd Valley Light Railway served the dale above Pateley Bridge to Angram, it was built for transporting materials and machinery to Scar House, costing £40,000. The line was open to the public between Pateley Bridge and Lofthouse but closed in 1929 a few years before the dam was completed. It was dismantled but remains of the line can still be seen in some places around the reservoir. We drive up Nidderdale from Pateley Bridge to Lofthouse and turn right to Scar House Reservoir. We park in the car park and walk forwards turning right to the information board. We turn left out of the car park and picnic area, head forwards and then turn right over the Dam. At the other end of the dam we turn immediate left and follow the circular route by the edge of the reservoir. We go through a gate and keep heading forwards. We pass over a stream and by a shelter with seats inside. We keep following the path and start to go uphill until we reach Angram Reservoir. We across the dam and at the other end we turn left the sign post says Scar House Circular. We now follow the track, passing another shelter with seats inside and a table and bench to the side of it, all the way back to Scar House car park. This is an easy walk on good paths and level tracks with one incline. Approx 4.25 miles allow 1 hours 30 minutes using OS map OL30 Yorkshire Dales, Northern and Central areas. Wensleydale and Swaledale. Scar House Reservoir in Nidderdale, Yorkshire Dales. From Ripon take the B6265 into Pateley Bridge OR from Knaresborough take the B6165 into Pateley Bridge. In Pateley Bridge go over the bridge and take the left turn, small road, to Ramsgill, Bouthwaite, Lofthouse, Stean and Middlesmoor. On leaving Lofthouse look for the blue sign Scar House Reservoir on the right and follow the small tarmac road for about 4 miles which leads to the car park. There are public toilets at Scar House Reservoir and also in Pateley Bridge located in the park area and in one of the car parks. For refreshments there are shops, cafes, a butcher, two fish and chip shops and three pubs The Crown, The Royal Oak and The Bridge Inn in Pateley Bridge. There are ample places to stay in Pateley. At Ramsgill there is The Yorke Arms and at Lofthouse there is The Crown both the latter have accommodation.